Next week should kick off with a Court of Arbitration verdict that will clear the way for some British athletes to compete in London, despite a British Olympic Association (BOA) policy that hands down lifetime bans for doping offenses. This in turn invites debate (and some heated emotional responses) on what exactly should be done to dopers – lifetime bans, or the current two year sentence, or some alternative? In case you haven’t followed the story, the BOA policy is that it does not select athletes who have served doping bans of six months or more to their Olympic team. This means that athletes such as Dwain Chambers and David Millar, having served their bans as a result of the WADA code, were ineligible for selection to the British Olympic team. The World Anti-Doping Agency (WADA) challenged this policy as “noncompliant” with its doping code, since the WADA code hands out a two-year ban to first-time doping offenders. The BOA appealed this WADA ruling, and the case has now been heard by the CAS in Switzerland. Ever since the case was heard in March, it has been predicted that CAS will reject the BOA appeal, and thus “force” the selection of these athletes should they qualify for the British team. The “certainty” over the decision is due to a precedent set last year, when CAS ruled against the International Olympic Committee in a similar case. In that case, the IOC had a rule that banned an athlete who served six months or more for doping from competing in the next Olympic Games, but the same panel which heard the BOA case decided that this too amounted to an additional sanction that could not be upheld. The end result was that it cleared the way for former 400m World Champion LaShawn Merritt to run in London, and it should do the same for athletes like Chambers and Millar (depending on selection criteria, of course). To give my personal opinion, it seems quite clear that if the global body (WADA) that has been tasked with fighting doping has a rule that bans an athlete for two years, then its global collection of member bodies (including the BOA) must comply with that rule. One can’t have a handful of countries that comply with parts of the global code, but have their own rules in other areas. Think of the exact opposite scenario to illustrate the concept – an athlete dopes and should receive a two-year ban, but the athlete’s national body decides that it’s worth only a 1-year ban, or no ban at all. There’d be an outcry. The member parties of WADA are tasked with implementing the global code, not modifications thereof, and so it seems fairly clear then that the CAS decision to prevent further sanction is, by the letter of the law, the right one. However, there is a much larger question in play here, and this is whether the global standard needs to be shifted. Even the BOA have conceded that while they may not win this particular battle, they may be taking a significant step to advancing the “war” on doping by raising the question of whether dope cheats should be allowed back into the sport so soon? The case then becomes more about the WADA rule than it does about the BOA selection policy, and that’s the bigger picture here. Doping control has, it must be said, become more and more mired in legal challenges and loopholes in recent years. The Contador case was an illustration of this, but it was not unique. The ever rising cost of court cases that challenge doping results threatens to a) financially hamper anti-doping processes, and b) drag doping cases out to the point that athletes can now receive two-year bans that actually last only 6 months (exhibit A: Alberto Contador). From a scientific point of view, the reality is that the blood and urine tests that we used to think were “foolproof” are now merely the first step towards a sanction, with an often lengthy and expensive court case standing in the way. This means that more money is required to refine the testing processes and for conducting the doping controls at major events. Failure to obtain this funding leads to what was alleged in cycling recently, where the biological passport testing declined to a slow trickle rather than a raging torrent it needs to be. Not only that, but the number of athletes who have admitted to doping without ever being caught highlights the difficult in catching sophisticated dopers, and it also makes a mockery of the “look how many times I have been tested” argument so often put forward to “prove” that an athlete is not doping. The end result of all this is that doping control is becoming a complex legal battle, and not the clean ‘test and ban’ strategy that it was perhaps hoped it would be. Therefore, the discussion over whether a doping ban should be two years, or a lifetime ban, invites discussion over what legal implications this will have given the already murky legal lines that have been drawn. The reality is that the harsher the punishment, the more certain the verdict must be. And the problem is that in the current anti-doping climate, the verdict has never been quite as uncertain or shaky. The reasons for this uncertainty are numerous. First, tests can produce false-positives and are thus challenged on the basis that anti-doping policies do not conform to statistical standards from forensic science. Secondly, there is a risk of contamination of supplements – look at the number of cases for the stimulant methylhexanamine in 2010 and 2011. Third, and similar to contamination of supplements, is the possibility of banned substances through food ingestion, as was raised by Contador, by shown in this study [cite source=doi]10.1002/dta.1330[/cite]. Fourth, there are allegations of cover-ups, stings, corruption that undermine the credibility of the anti-doping process. For all the above reasons, it would be difficult to dish out a lifetime ban to a first-time doper. The ‘burden of proof’ is simply too high, and while many of the above mentioned factors have counter-arguments (the biological passport, for example, while not foolproof is constantly improving and has numerous checks and balances to ensure that it doesn’t unfairly ban cyclists), the reality is that all these factors exist as loopholes. And any athlete, driven to win (and therefore to dope), is going to be driven to find these loopholes when their career is under threat. So when Athlete X tests positive they will, inevitably, turn all their attention and often their legal might to have their name cleared. That’s for a two-year ban. Now imagine the stakes are higher. Imagine a lifetime ban is on the table. Then the legal pressure on the authorities to prove, beyond any shadow of a doubt, that Athlete X was doping, becomes that much higher, and I’m not sure this is a pressure that should be invited at this stage. I think that anti-doping has made enormous strides in recent years, and particularly in cycling, the proper implementation of the biological passport has been extremely positive. But, the flip side of the coin is the recent discussion that highlights a growing concern that the passport is no longer being used as effectively as it might have been, partly because of escalating legal costs and the time involved fighting back against the attacks on credibility. So the better solution, for now, is to tighten up testing processes, and improve the science. Make sure that the process by which dopers are caught is rock-solid, and able to stand up to even the tightest forensic and legal scrutiny, and then let’s look at four-year bans, perhaps as the next step towards lifetime bans. There is of course also a moral and ethical position on this. An athlete who dopes has (often) gone out of his/her way to cheat, and this means denying other athletes equal rights on medals, money, prizes, achievements (not necessarily in that order). This doping athlete is effectively fraudulent, and so there’s an analogy to business here – if any CEO is exposed as stealing money from his company, or his clients, he is unlikely to be welcomed back into the world of business after serving his punishment. And the BOA, in their case against WADA, did argue that when athletes themselves are asked, they are in favour of life-time bans, because they are the ones most affected by cheating. Their voice should probably be considered as important in that regard. However, doping in sport has always been a little different. I don’t condone doping – I am very much against it (hence the frequency of critical posts on this subject on this site). But I can also summon up some sympathy for those caught up in a corrupt and dishonest system that really facilitates doping. Last year in November, I heard David Millar talk at the UKSEM conference, and he explained how he gradually moved towards accepting doping, because of a culture within the team, by those in charge. Others have said similar things, and I am somewhat sympathetic to the plight of a young man or woman who knows nothing other than their sport, and finds themselves at a cross-roads very early in their career (or lives), with guidance coming most strongly from those who are advocating doping. These are not therefore the CEO-equivalent of businesses, to return to the previous analogy. They are the junior workers, who are led to doping by CEOs just to keep their jobs, in many cases. And their choice must seem devastatingly simple at the time – give in and dope because it is often the only way to remain competitive or employed. Or, resist the temptation and retire to a life of…? There’s often no fallback, other than retirement, or become a painter, as Alex Zulle (I think) once famously said. It’s a very difficult position. My current one is that until the science is even tighter, and able to stand up to the inevitable legal onslaught that lifetime bans would invite, the current two-year policy is correct. The first objective in the “war” should be to extend the ban to four years, thus ensuring that at least an Olympic Games is taken away from a doper. This requires advances in the science and probably the “investigative process” by which doping is uncovered. But a lifetime ban, I think, is far in advance. As for the moral and ethical debate, I’d love to hear your views! The other interesting point from last week was the announcement of Kenya’s Olympic marathon team. On the women’s side, there’s perhaps less controversy, with the brilliant Mary Keitany the first name down, followed by Edna Kiplagat and Priscah Jeptoo. They showed form and class in London, and perhaps only Sharon Cherop, who won Boston the week before, can feel a little hard done by. But on the men’s side, it was always going to be a mighty difficult selection. The difficulty is illustrated by this fact: The current world record holder (Patrick Makau) and 2011’s top marathon man (Geoffrey Mutai) are both OUT of the Kenyan squad, and will not run in the Olympic Games. The three eventually named are: Wilson Kipsang, who, by virtue of his London win was probably the “easiest” choice to make. He’s joined by Abel Kirui, twice world champion, but only sixth in London, despite running a brave race to follow and attack with Kipsang at halfway, and finally Moses Mosop, who won Chicago last year, but who was pretty handily beaten by two Ethiopians in Rotterdam recently, despite talking up a world record before the race. Dealing with Kipsang first, he must be the favourite for Olympic gold now. He won London by over two minutes, with a ferocious mid-race burst, and has won marathons in fast times in the last 11 months, including that 2:03:42 second fastest of all time performance. So no controversy with his selection. The debate is around Mosop and Kirui. And let’s be clear – if they go on to win the Olympic Gold, it would not surprise me in the least. Kirui in particular has shown his ability to race in championships with two commanding World Champs gold medals. In London, Kirui looked magnificent up to about 30km, but paid for the 14:09 surge between 20 and 25km, and ended up going backwards and ‘crawling’ home with a 8:33 final 2.2km! Had he steered clear of the mid-race surge, it’s not difficult to imagine that he’d probably have run a 2:05, maybe low 2:06, and that would have made his selection seem a lot more reasonable. His aggression off a fast pace cost him, and he ended up running outside 2:07, very slow by today’s extra-ordinary standards. Still, I’d have Kirui in my team, because off a slow pace to halfway (think 65 minutes), he’s shown tactical experience and quality. Mosop is the third name. Despite the talk of a world record in Rotterdam, he not only missed that time, but was beaten into third by two Ethiopians. Mosop clearly has tremendous speed and pedigree, having won Chicago in a course record, and chasing Mutai home in Boston with his 2:03:06 (which has really been put into perspective by what has happened since). Before Rotterdam, his coach Renato Canova talked up how nothing but a world record would get Mosop onto the team, and that seemed accurate. But then Boston dished up a super hot day, with temperatures on the tarmac rising to almost 100F (38 C), and Geoffrey Mutai was the victim – stomach cramps forced him to abandon the race after halfway, and so he failed to stake his claim in the minds of the Kenyan selectors. His case, then, was his 2011 form, and also his pedigree at the shorter distances – he was the Kenyan Cross-country champion in 2011. Those credentials would have seen me pick Mutai, I have to say, mostly because of his ability to win non-paced marathons (Mosop has not won a marathon without pacemakers, and has only one win in three starts). Both Boston and New York in 2011 saw Mutai dominate strong fields without pace-setters. His New York win, for me, was particularly impressive, and I’d have put Boston down as a bad day, an anomaly perhaps caused by the heat, and gone with Mutai instead. Makau too failed to finish his “audition”, and he dropped out after only 16km in London. The reason, apparently, is an injury, and I guess that may have played into his omission from the team. The other factor to consider, for both Mutai and Makau, is that they don’t have a marathon in their legs as we move into the final three months of preparation before London. That’s the other reason I would have picked Mutai – the time frame is a little tight, and the likes of Kipsang, Kirui and Mosop will have to produce another world class marathon on 14 weeks after their last. This is possible, and we may see athletes perform with even tighter calendar constraints later this year when a lot of Olympic runners also race New York or Chicago, but it’s another factor in an intriguing mix. It may well be that success in the Spring counts against runners come Summer. At least the question is out the way for Kenya, and the three men who will try to defend Wanjiru’s Olympic crown in London. And as I said, it is quite conceivable that any one of the three can win gold, and that they can sweep the podium. I doubt it, because the Ethiopian challenge this year is very strong, and even the gold medal will be strongly contested, but it’s a super strong team. I would have chosen Mutai, myself. Your thoughts welcome, as usual. On the women’s side, in terms of the Olympic race, the fascinating question is to see how Liliya Shobukhova deals with the Kenyans, particularly Keitany. Shobukhova is actually faster than the Keitany, by virtue of her 2:18:20 in Chicago in 2011. So her recent form is good, the manner of her Chicago wins is impressive – front-running and very strong second half, like Keitany. But Keitany must be the favourite, simply because her final 10km in London, in about 31:35, were extra-ordinary. But that will be a tremendous battle. Speaking of their meaning, here’s a short explanation of the names, the designs and the significance. 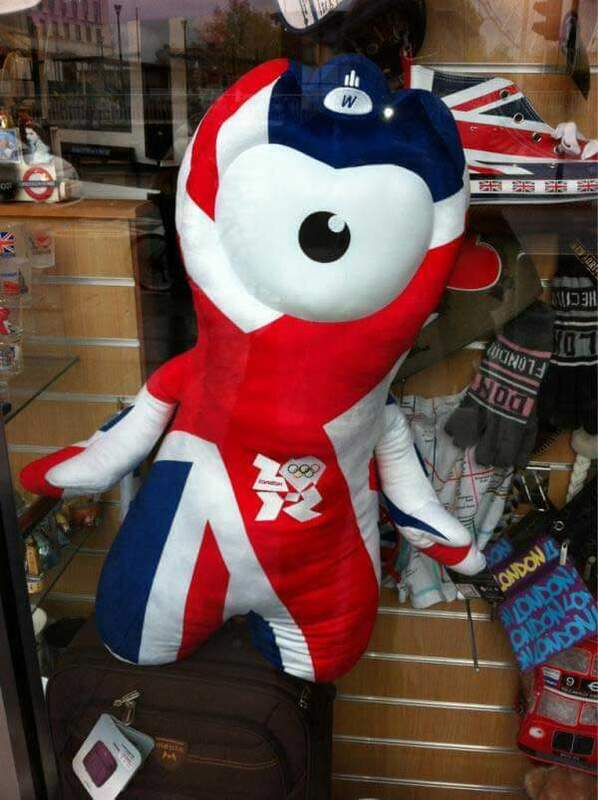 Wenlock and Mandeville have a lot to live up to!